The 2016 IIHF World Championship was the 80th such event hosted by the International Ice Hockey Federation (IIHF), being held in Moscow and Saint Petersburg, Russia, from 6 May to 22 May 2016. Canada entered the tournament as the defending 2015 champions. Hungary returned to the Championship after a 6-year absence, and Kazakhstan after a 1-year absence. 2016 postage stamp of Russia, dedicated to 2016 IIHF World Championship. Laika, the mascot of the championship, is in the centre. Canada won their 26th gold medal, defeating Finland 2–0 in the gold medal game. With the win Corey Perry became the second consecutive Canadian team captain to earn membership in the Triple Gold Club. Russia won the bronze medal, defeating the United States 7–2 in the bronze medal game. There were three official bids to host these championships. The decision on who hosts the tournament was decided during the final weekend of the 2011 IIHF World Championship in Bratislava, Slovakia. Denmark has never hosted these championships. The tournament was proposed to run from May 6–22, 2016 in Parken Stadium (Copenhagen, 15,000 seats) and Jyske Bank Boxen (Herning, 12,000 seats). Russia was the only bidder to ever have hosted these championships, with the most recent being in 2007. 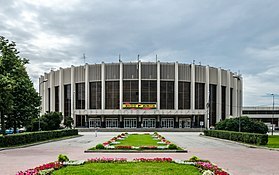 The tournament was proposed to run from April 29 – May 15, 2016 in Megasport Arena (Moscow, 13,577 seats) and Ice Palace (Saint Petersburg, 12,300 seats). 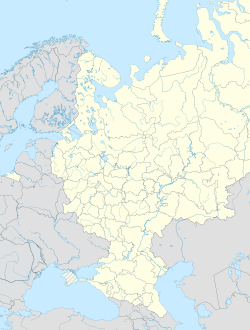 Ukraine, like Denmark, has never hosted these championships. The tournament was proposed to run from May 6–22, 2016 in Palace of Sports (Kiev, 7,000 seats) and a new 12,000 seat arena to be built by 2015 in Kiev. The 16 teams were split into two groups of eight teams. After playing a round-robin, the top four teams advance to the knockout stage, to play out the winner. The last team of each group will be relegated to Division I the following year. The seeding in the preliminary round was based on the 2015 IIHF World Ranking, which ended at the conclusion of the 2015 IIHF World Championship. The schedule was released on 15 July 2015. ^ The rules state that "the bottom ranked two teams will be relegated" and the 2017 hosts (France and Germany) cannot be relegated by rule. ^ Merk, Martin (2015-06-02). "To Russia with love". IIHFWorlds2016.com. Retrieved 2016-05-14. ^ "Connor-da Gold!". iihfworlds2016.com. 22 May 2016. ^ Nelson, Dustin L. (May 22, 2016). "Corey Perry Enters Triple Gold Club". The Hockey Writers. The Hockey Writers. Retrieved May 22, 2016. ^ "Happy ending for hosts". iihfworlds2016.com. 22 May 2016. ^ "Russia to open vs. Czechs". iihfworlds2016.com. 15 July 2015. ^ "Tournament Format". iihf.com. 22 April 2016. Wikimedia Commons has media related to 2016 IIHF World Championship.